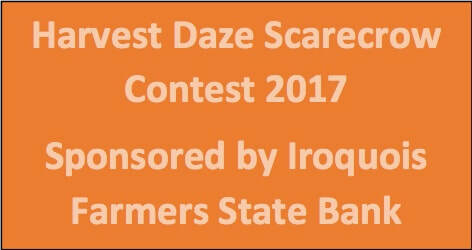 Scarecrow entry deadline is 4 PM, Thursday, Oct. 6. Scarecrows must be set up by 9 AM, Saturday, Oct. 7. You may register online from the form at the right or print an entry form and complete rules here. You may also pick up an entry form from the ICHS office in the Old Courthouse Museum. Have FUN! Entry is free---Contest is open to ALL ages, individuals, families, clubs, groups & businesses. All entrants must agree to allow use of names (s) and photos for promotional purposes. All entries must be original hand crafted scarecrows. Scarecrows can be standing or sitting on props such as chairs, straw bales, bench, or bike, which would provide stability. Entries will be left outside in any weather. Entries must be appropriate for a family event, no political or controversial subject matter will be allowed. The Iroquois County Historical Society has the right to remove any offensive entries. Installation is the responsibility of the entrant. Scarecrow entry deadline is 4 PM Oct. 6. Scarecrows are to be set up by 9 AM Oct. 7. 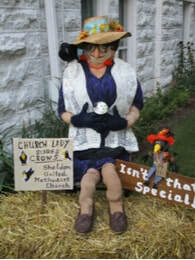 Scarecrows muct be removed from the grounds no later than 1 week after the close of Harvest Daze. Prizes will be awarded: 1st $25. 2nd $15. 3rd $10.